First of all we'd better define what we mean by a senior dog. We humans tend to think of ourselves as Senior Citizens when we get to the age of 60-65 years, even though the joints may start creaking a few years before this! The 'one human year equals seven dog years' rule is an easy way to calculate and relate to your dog's age, but doesn't necessarily apply to all breeds. Large breed dogs (i.e. Great Danes) are considered a senior at 6 or 7 years of age, whereas small breeds (i.e. toy poodle), aren't considered a senior citizen until they reach into the teens of years. So, if your dog was a human, how old would he be? Pedigree have a nice interactive chart which if nothing else is a bit of fun. Click here to check out your dog's age in human years. 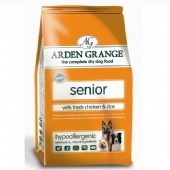 As dogs get older their nutritional needs change. They need a more digestible food lower in calories. You will need to watch your dog’s weight carefully to prevent middle age spread! Older dogs, like us humans, can suffer from joint stiffness and can be prone to arthritis. As well as containing less calories and being made with easily digestible fish for its protein source our Senior/Light food contains the supplements Glucosamine, Chondroiton and MSM to reduce joint wear, fight arthritis and elevate joint pain and stiffness. Basically, if your dog is 7 years or older, you ought to be considering him or her to be at least middle aged if not senior and therefore need to consider how best to care and feed them. This is because, like humans, requirements for exercise and nutrition change with age, and there may be a case for including a food with added 'extras' for joint care. So what some of the normal signs of ageing? Many dogs will slow down a bit with age, and you may not realise this is happening until someone points this out to you. Look for changes in how they gets up, lay down, and use stairs. Is there any hesitation or stiffness? Does a change in the weather make it worse? Dogs are no different to humans and do suffer from arthritis and stiffness. This can be treated. Grey hair, especially around the face and muzzle, can be a sign of a senior dog and so is a thinner, drier coat, compared to the one she sported in her youth. Of course, just as with humans grey hair is a sign of wisdom and dignity and your dog should be treated as such! Hearing loss or deafness may become a bit of a problem, and again you might only notice this when the situation has got to a certain point - when they keep walking after you call instead of returning as they used to. There isn't a lot that can be done for age-related hearing loss, but a veterinary examination can rule out other medical problems. Incontinence, even in dogs who were perfectly house-trained, is one of the most frustrating age related problems to deal with. Although loss of bladder control can be a sign of Diabetes.or kidney disease, and these serious conditions must be ruled out before treatment begins, urinary incontinence is usually caused by an infection or age-related changes. Mild loss of muscle mass, especially the hind legs, may be seen with old age. You need to be aware that some loss of muscle mass can be a sign of diseases such as Cushing's Disease. Be safe and have your veterinary surgeon check this out if you are at all concerned. Lumps and bumps can be more prevalent in old age, so if you find new or enlarged lumps under the skin or when you are stroking your dog, take a trip to your veterinary surgeon and for your own peace of mind have them checked out - there may well be nothing to worry about. Dogs should not drink more water simply because they are old, it is summer time, or the heater is on in the winter. Possible causes of increased water intake can be diabetes and kidney problems. If you feel that you would like to make use of foods which have added 'extras' for the older dog, then we would suggest looking at the online supermarkets who have a good range of products - a small pet shop cannot be expected to hold stock of every brand and variety that's out there at the moment.